The X8 has more weight a more solid sound with it switched to 24 volt . I'm using a dangerous D box and a big ben and there has been an improvement in sound quality with the X8 . I will know more once I track with the new conversion . best audio interface. clearer mids better image , better converters the difference is huge than the previous versions! great job uad! thanks for the upgrade! I finally made the plunge into the UA universe and it has made a world of difference in my output quality. I will never turn back. Excellent D/A converter, UA finally nailed it! Upgrading from Apollo Twin MK2, it made my monitor speaker sound much much better. 6 DSP core is a big bonus. Easy to use , sounds great, you wont be dissapointed ! I originally had the Apollo 8 duo and upgraded to the Apollo 8x. When I first hooked it up the sound sounded too clean for my taste because the older Apollo I had added this padding and warmth to the sound that was so perfect its hard to describe. The shiny and bright sound of the new Apollo was hard to accept. I tried different settings of cue mixing, went back to re-mix other projects and everything. Then somehow after I had clicked +24db and something else I did, the warmth came back, but this time with depth, clarity and space! So now I am extremely pleased with the sound! But, the only other issue I had was, the processing power seems weaker than my Apollo duo for some reason, and it wasn't until I hooked both of them up together that the power returned. If I could open up all the cores I would rate this a 10! Chose to upgrade from a Apollo 8 and a Twin to this beast. I run it together with a Blackface 8P for more preamps, and it is the heart of our small studio. I was surpriced that I actually could hear a difference in sound. It's not a groundbreaking difference from the Apollo 8 (gen 2), but audible none the less. I had an Apollo Quad for the last few years, which I loved. The new x8 is at an even higher level..I know it sounds like a cliche..but it really is more open on the top end and the sound field appears wider. Really happy about having an increase in DSP power. I also love some of the new function features. I can't say enough good things about the x8. Love the low latency, ease of use and streamlined workflow in any situation. Be it mixing, recording or creating. great clean sounding interface , console app takes a bit to get your head around. The unit is quick, transparent and smooth . Selling off my older HD system now. I am going to buy another soon . I used an Apollo 8 / Satellite Quad combination before and was sometimes frustrated that I could not use the DSP power of both units combined. Now, that has been fixed with Apollo 8x which has all DSP power I need in one spot. I’m coming from an RME UFX and wanted to upgrade mostly to thunderbolt from FW because i felt like FW was disappearing... put the Apollo X8 in my system and just cranked AC/DC Thunderstruck! The DA was not just a subtle experience. It sounded much more 3D. Made my Dynaudio 5A’s sound like very expensive monitors. Apollo x: Present and Future of the recording and the musical production. I am very happy with the extreme audio quality obtained with my new Apollo x8. In the Studio we also have an A/D & D/A converter (Symphony I/O from Apogee) and in the tests we have done comparing the conversion in real time with 24Bits / 48Khz files the result is surprisingly similar. Only for this update in the converters, I consider it a winning horse. It is also worth mentioning the four Mic Preamps (with the advantage of the Unison™ preamp emulations), the fantastic quality of their emulations in their plugins and how stable is the software (Application) Console + UAD Meter & Control Panel. Good work Universal Audio !!! Though a happy 3 year+ owner of an Apollo 8 Duo, I decided to "upgrade" from what I thought was already a terrific interface. Well, after a couple weeks with my new Apollo X8 I can honestly say I am NOT disappointed. Having more UAD DSP is great, and there is, to my ears a more transparent audio quality. I call it an extended dynamic range. As good as my Apollo 8 sounded, the X8 just seems more open sounding. Having the talkback is useful, and just overall, I couldn't be happier with my decision. 5 Stars. an AMAZING improvement over my Apollo twin setup. it sounds amazing, loving the hexa and the talkback! GREAT JOB ! Great product with more I/Os. I use Apollo | twin for the past few years. 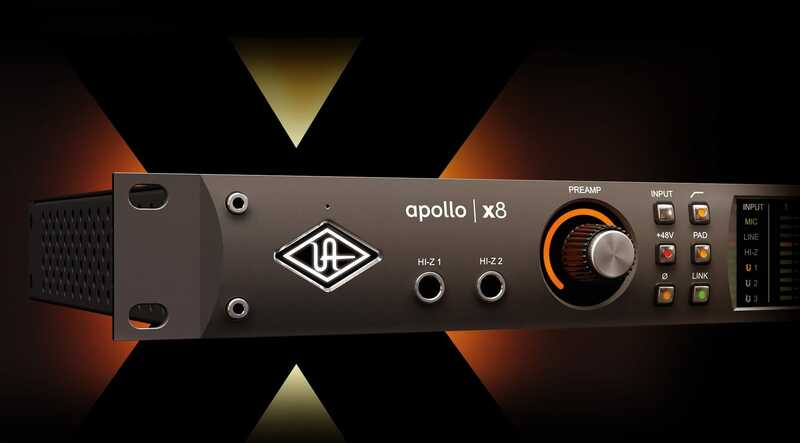 Decided to add this Apollo x8 to do Audio Post mixing. So far so good. I have not tried 5.1 setting though. However, Apollo x8 should do fine. I use this to Record My Rolaind TD50 Drum Seet I Bring in all of the Drums and Cyembles non there on track. Work well.